Paul joined CeRDI in 2003 and has over 10 years' experience in both front end and back end development utilising various open source technologies. Recent major projects as a lead developer include Waterwatch Victoria, EstuaryWatch Victoria, Online Farm Trials and Sport and Recreation Spatial. 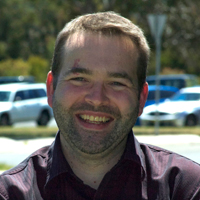 Paul completed his Bachelor of Computing/Bachelor of Commerce at the University of Ballarat in 2001, and completed his Honours in Computing during 2003 while working part-time with CeRDI.